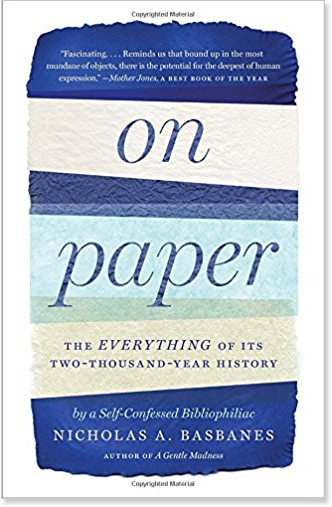 I am slowly working my way through ‘On Paper: The Everything of its Two-Thousand-Year History’. Instead of reading a book covering such a topic on paper – as one would expect – I actually bought the ebook version. It is a bit cheaper and you can download it immediately instead of having to wait for delivery. I can take the book (and a few dozen others) with me in my coat and frankly I don’t really find that paper itself adds that much to the reading experience. There are very few types of paper that have a distinct and enjoyable feel to them and those are never used in paperbacks. The contrast between ink and paper is excellent but on the other hand, my Kindle’s front-lit screen is a joy to read in the evening or on gloomy days. Don’t even get me started on ‘the smell of paper’. I much prefer not to smell books at all. There is, however, one thing I really miss using the Kindle Paperwhite and that is cover art. When you read a printed book and have it lying around, you’re always looking at the cover or spine when you pick it up. My Kindle is protected by a case so all I see with any book is a beautiful leather-like orange-red wrapping. Opening the case switches on the device, briefly showing some well-done but irrelevant screensaver image and then the page I was reading last. My wife made me realize what got lost when she occasionally asks what I am reading. Sometimes I don’t remember the name of the author, sometimes even the title of the book. You only get to see those while you buy the book and when you first open it. A name like Haruki Murakami is hard to remember, for me at least, when you aren’t reminded of it from time to time. There are other e-readers that do show the book cover when they are switched off. While writing this post I even learned there is a hack for the Kindle to make the front cover image reappear. It is simply curious that a company that started off selling books and whose leader proclaims to love them, actually does its best to make book covers disappear. They don’t seem to be willing to accept that ‘the e-reader is the book’. Amazon sells Kindles at a discount if you enable ads; then it shows them as a screensaver. If you pay more(or just complain to them, as I found) they will turn off the ads but then you just get the 3 or 4 generic screensavers. There is a hack to use the cover, which I really want too, but to do that you need to jailbreak it, and there is no jailbreak for the current firmware– unless you are permanently in “airplane” mods, the Kindle will update firmware immediately to the latest version. I totally agree! I, too, love my Kindle, but also miss seeing cover art. I’ve also experienced not being able to remember a title or author, even a couple of hundred pages into the book. I hope you will share the hack that allows display of the cover!